All surf trips are different. Some surf destinations might not even have cars! Some surf breaks are only accessible by boat. But there are plenty of surf trips where you land and have to drive to the surf break. Or you have to drive around to different breaks. 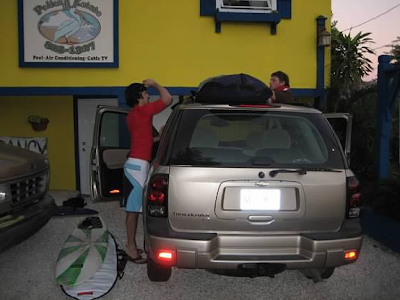 Here are some of the advantages to renting a car for your next surf trip. Traveling from the Airport. Pretty obvious. Maybe your spot offers a shuttle, or maybe you can find a reliable taxi. But if not, you'll need a car to get you from the airport to the surf breaks. Getting to Other Surf Breaks. Many surf trips are to places with multiple breaks nearby. And to get to those breaks, you will need a rental car, it’s that simple. Before your trip, try to figure out as much as possible about the breaks that you’ll be riding to so you can figure out if you need a special type of rental car. Does it get muddy, hilly, mountains, sand, 4x4 capability - all are questions to consider before you rent a car. You don't want to rent a car to drive to all the surf breaks and then not be able to access them. 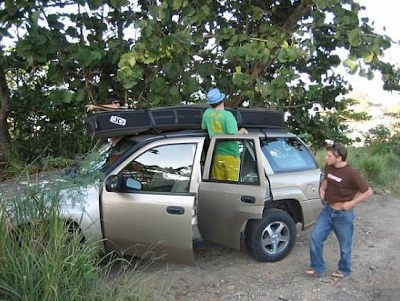 When you've got a car, you can surf whenever you want; just strap your boards out of their surf travel bags and onto your surf roof rack. Sustenance. I know there are surf trips out there with all inclusive accommodations that serve you meals, sell beers and make it so that you don’t need to buy anything once you get there. But there are all those other trips (i.e. cheaper ones) where you don’t have that luxury. So it’s your job to find a grocery store, find the roadside stands, or find the markets where you can get food! Maybe take-out for a week is ok with you, but you probably need some other food too. Also, you need a car to get to the liquor store to grab those Imperials or Tecates or Medallas or whatever the local beer is. If you don’t have a car, what happens when you dig your foot into the reef? You’re gonna need a car to find some tweezers and medical supplies (although you should have packed them). Sightseeing. Having a rental car on hand on a surf trip allows you something to do on those days when, heaven forbid, it’s flat. The best surf spots have all kinds of other adventures nearby and you need a car to get to them. Rainforests, caves, diving, snorkeling, mountains, waterfalls, hiking, restaurants, nature preserves: you will likely need a car to get to most of them. So make sure you have a back-up plan for flat days by getting a rental car. Night Life. Understand that we are fully against drinking and driving, but often on your surf trip you will need a rental car to get to the clubs or bars or little concert spots where all the night life is happening. Again, you may be able to find a driver to take you to them, but it will be a challenge trying to arrange for a ride home from the bar at 2 am with a driver who only speaks Spanish who doesn’t have a cell phone – and neither do you. With a rental car, and a designated driver, you can go to whatever bars you want, stay out as late as you want, and if you’re lucky, bring some new friends home with you.